Coulomb is building the infrastructure for electric vehicles, but it’s still unclear how many electric vehicle charging stations are needed. Wouldn’t you rather charge your car at home? 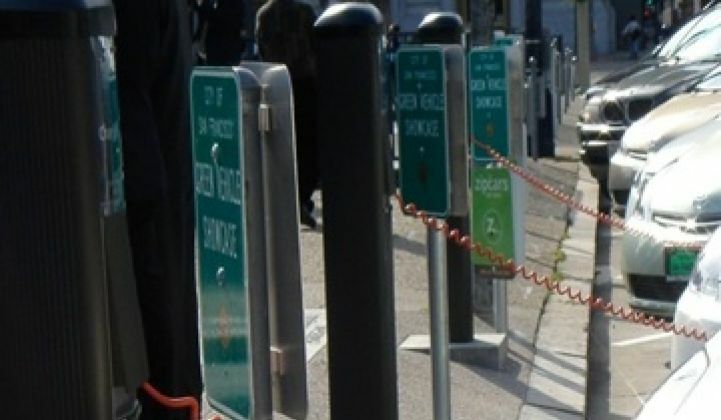 Charging stations are being erected all over the country. Coulomb has a $37 million ChargePoint America program that will help put them all over the place. In just two years, the company has shipped 850 stations to cities around the world, including New York City, Orlando, Detroit, Amsterdam, Sydney, and Dublin. Today, Coulomb Technologies announced it has raised $15 million in Series C funding. The new funds come from previous investors -- Rho Ventures, Voyager Capital, Siemens Venture Capital, and Hartford Ventures. Harbor Pacific Capital and LS Cable and LS Industrial Systems are newcomers. "The money will help us expand the network. We have shipped 850 stations. ChargePoint America is installing 4,600 charging stations. This extra money will help enable that," said Anne Smith, a spokesperson for Coulomb. Coulomb will be working with Leviton, Siemens, and Aker Wade to distribute their equipment to the home, which will open up options for home fueling. The Department Energy project, ChargePoint America, is setting up 4,600 free home and public ChargePoint stations in nine areas of the United States: Los Angeles; New York; Austin, Texas; Detroit; Orlando, Fla.; Sacramento, Calif.; the San Jose and San Francisco Bay Area; Bellevue and Redmond, Wash.; and Washington, D.C.
With the introduction of electric cars and plug-in hybrids like the Leaf and the Volt, Coulomb is strategically partnering with three leading automobile makers: Smart USA, Ford, and Chevrolet. It's not all sunshine from here. There is a big debate over whether we will even need extensive public charging facilities. Some argue that most people will charge at home and tap the energy flowing from their local utility instead of relying on public charging stations. Hence, these public charging stations might just be a psychological salve that may take years to pay off and may not be used that much. "We see it as very important from a psychological perspective and for places outside the normal commute patterns, but our focus will remain on residential charging," Rich Steinberg from BMW said recently. "In megacities, [public charging] makes sense, but not so much in most of the U.S."
Another issue: consumers might be able to just top off at work or at parking garages under a "pay-by-the-kilowatt" model. Recently, California removed one EV charging hurdle, giving virtually almost anyone the right to sell power for EVs. Coulomb and others want to sell power under subscription services. "Coulomb continues to make great strides as an emerging leader in the EV infrastructure space. They are quickly expanding their footprint and building a compelling, sustainable business," Mark Leschly, Managing Partner of Rho Ventures said in a statement. Nevertheless, the process of building out the infrastructure continues and these charging companies will play a huge role in the effort to get more cars to charge during off-peak times, regardless of whether the charging station is at home or in the parking lot of Guitar Warehouse. Better Place is working with the Hawaiian government to build switch stations, so car owners can have a place to turn in their depleted car batteries in exchange for fully charged ones.